Just hover your mouse pointer on the recipe and click once to get detailed recipe. I shall keep this updated with new recipes which I would be including in my blog. So please bookmark this page to catch up with all updates in future. 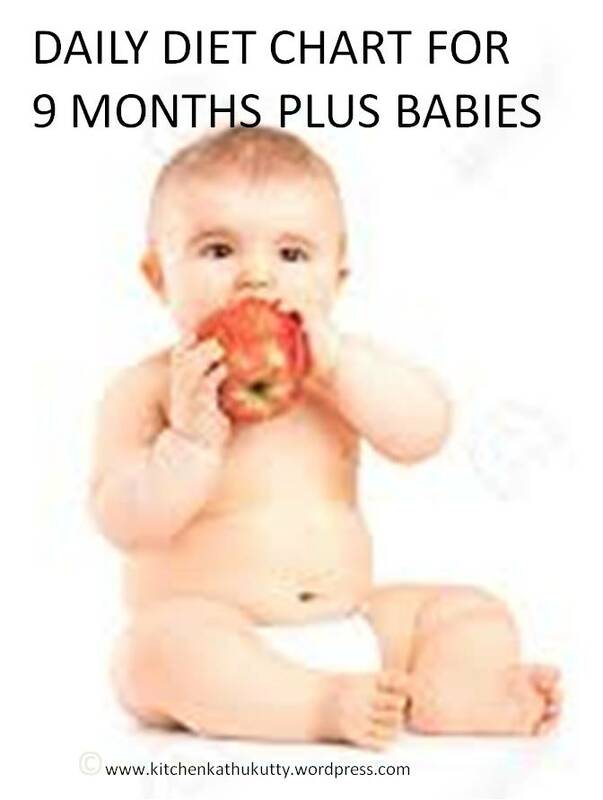 Until one year don’t replace breastfeed by any solids. Always have a word with your pediatrician before introducing any new food. Do consider history of family allergies when introducing new foods. Until two years kindly breastfeed baby on demand.It is a recommendation from WHO. Do include as many varieties as possible in baby food. Avoid honey,sugar,salt,milk till one year in any form in any quantity. I would have incorporated three day wait in early stages of diet charts. It is said to be obsolete now.So you can ignore them and just watch for allergies carefully. The above chart has been put up to just provide an idea and this can never be an alternate to any medical expert advice. Always use sterilized bowls and spoons to feed baby. Prefer open cup and spoon instead to bottles and sippers. Posted on 02/01/2016 by Kalyani BalajiPosted in Baby Food, diet chartTagged 10 month diet chart, 9 months completed baby diet chart, daily diet chart for 10 th month baby, daily meal plan for 10 th month baby, diet chart for 10 th month.